The 2018 Trump stimulus exceeds the Obama-era stimulus package in size – will it pay off at the top of the economic cycle? In 2010, when Barack Obama pushed for a stimulus package to help boost the American economy, it was decided by many in the GOP as wasteful spending. While there are more productive (infrastructure) and less productive (tax rebates) ways to stimulate the economy, any form of spending (or tax cut) is a form of economic stimulus – this is a point agreed by both economists and businessmen like Warren Buffet. In fact, any form of budget deficit is a form of stimulus, as the government borrows (or prints) money that it doesn’t have to spend it into the economy. The past year has seen the GOP enact not one but two stimulus measures – first a budget which ended Obama-era budget caps and boosted spending by roughly $150B per year, and second the tax cut which reduces taxes by another $150B per year. Taken together these measures are adding roughly $300B per year in stimulus to the US economy, potentially adding 1.5% to GDP for each of the next few years. Adding this stimulus to a core GDP growth rate of 2-2.5% might thus make 4% possible in the near term, with the bill due much later. The total federal (non-central bank) stimulus under President Trump’s first will hit at least $1.2 Trillion, exceeding President Obama’s 2010 stimulus package by $350 Billion , but this time at the top of the economic cycle! While most economists agree that it’s better to do fiscal stimulus when the economy is at or near recession, democracies don’t work this way, and there’s little correlation between economic need and actual governance. When either party has complete control of government, they take the opportunity to spend on favored initiatives – in Trump’s case the DoD received most of the benefit, while in Obama’s case a variety of energy efficiency, infrastructure, and other initiatives were funded. Budget deficits haven’t been a major issue over the last decade, but the tax cuts in particular will layer on top of Social Security and healthcare spending trends to drive debt-to-gdp well past 100% . The best stabilizers in the US economy (unemployment insurance) are effectively automated – extending this sort of stabilizer to infrastructure spending (spending more on transportation funding etc as unemployment rises) would not just help buffer downturns – it would also get taxpayers a better deal. Time will tell whether the GOP’s late-cycle spending will extend the business cycle substantially, but in the long run US policy will improve if more of these decisions are put on auto-pilot, removing the uncertainty of the political winds and the desire to spend at the least opportune times. The Obama administration stimulus plan cost around $850B in the end, including only the 2010 Stimulus measure and its implementation. Extension of Bush-era tax cuts and similar are not counted here, as these were extensions of existing measures, rather than new tax cuts or new spending as in the Trump administration’s recent moves. Many charts and news reports on the debt refer only to the publicly-held portion of the US debt, but when debts to the Social Security trust fund are included as in this data from the Federal Reserve, the US debt-to-gdp ratio already exceeds 100%. The House is likely to vote today on an updated version of the AHCA (the GOP’s Obamacare replacement) today. I’ve written previously about the bill, and noted that for a GOP-introduced bill, it was originally quite moderate – it embraced the notion of universal healthcare. The latest AHCA update is considerably more conservative, as it effectively allows states to eliminate most of the ACA’s universality. By bringing back medical underwriting, states will be able to roll the clock back to 2013 (pre-ACA exchanges), when individuals with pre-existing conditions generally could not obtain health insurance. Once the bill makes it to the Senate, it will likely have to be made considerably more moderate, as the GOP can only lose two GOP Senate votes, and a number of Senators have expressed reservations about the latest changes. The bill will still have to pass through reconciliation between House and Senate, and might die in that process, or might emerge more moderate in that process. It appears unlikely that it will pass through Congress as currently written, or in more conservative form. Even if the bill does become law as written, the 31 states that expanded Medicaid are unlikely to seek to remove pre-existing conditions coverage. Within the 19 remaining states, it’s unclear that state officials are willing to take the blame for rescinding that coverage. At this point, assuming the bill does make it through the House, it’s the Senate modifications and reconciliation process that will determine whether the final product is worthwhile. If the Senate is able to preserve universality, while strengthening tax credits for older age groups, a credible final product may emerge. The CBO generally performs careful, in depth analyses – but their approach is susceptible to inaccuracy when policy proposals differ sharply from existing norms. The CBO projects that over 24m individuals will lose insurance coverage as a result of the AHCA, as older individuals and Medicaid recipients lose insurance faster than younger individuals gain it. This projection misses the power of free plans, however. The table below shows how much different age groups might pay for coverage under the AHCA, with prices based on 2017 ACA exchange prices for states with low (Oregon), medium (Ohio), and high (Nebraska) insurance costs . As the table shows, the AHCA tax credits can provide catastrophic coverage to the majority of Americans below age 45. Using the information compiled above, we can estimate the change in uninsured rates for each of the groups in the chart below. 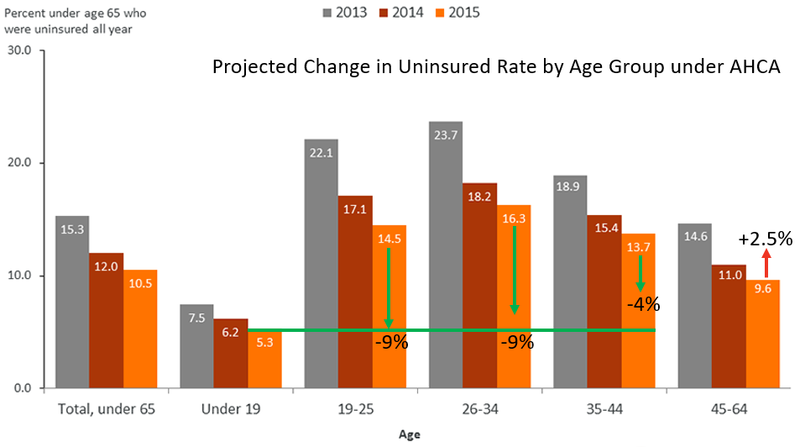 For age groups below 40, the uninsured rate is projected to drop close to the same level as that of children below 19, since these groups will have access to free plans paid for by tax credits (and insurance companies will market these subsidized free plans mercilessly). For age groups above 45, the uninsured rate will rise, though not quite to pre-ACA levels, when no support was provided. The CBO estimates that 14 million Americans will lose Medicaid coverage, and that 9 million more will lose either individual or employer-based coverage. Using population estimates for 2026, I calculate that the number of insured Americans aged 19-34 rises by 7 million, aged 35-44 rises by roughly 2 million, and aged 45-64 drops by roughly 2 million . While it’s important to note that these plans will be much less generous than ACA-subsidized plans, the total number of insured actually rises by around 7 million under these estimates. The GOP will have installed universal, nearly-free catastrophic plans as the future of American health care – if the AHCA passes, as Mssrs. Trump and Ryan continue their struggle to get it through Congress. P.S. If you are interested to find out more about how the AHCA might impact you or your clients’ investments, my company HiddenLevers has modeled that in our TrumpCare scenarios. Have a look through one of our free demo accounts. The 2017 ACA prices are a reasonable guide as the Trump administration plans to relax the essential benefits associated with plans, and to widen the max price differential between plans for young and old. The risk pool under the AHCA will also likely be healthier, as young, healthy Americans will be drawn into free AHCA plans – because they are free. Roughly 23% of the population is aged 19-34, and a 9% point drop in uninsured rate for this group in 2026, translates to a rise of 7m more insured Americans. A similar calculation for the 35-44 group yields another 2m insured Americans, while the 2.5% rise in uninsured among older Americans yields a loss of insurance for 2 million. The CBO appears not to contemplate that many of those losing Medicaid will receive tax credits sufficient to provide them with free catastrophic plans, as shown in the table above. This mitigates the Medicaid cuts to some extent. The original chart above can be found here at the CommonWealth Fund. The AHCA would move the USA toward universal catastrophic healthcare coverage, by enabling insurance companies to sign up individuals to $0 monthly premium plans with high deductibles and limited coverage. While healthcare analysts have been in overdrive commenting on the new GOP health plan, it appears that some key points have been lost in the noise. Whether on Medicaid, total enrollment, or tax credits, it seems that many analysts fail to understand the large-scale implications of the bill. As written, the AHCA has the potential to be transformative – it would retain the goal of universal coverage, while shifting tax credits toward universal high deductible insurance. If fully implemented, the AHCA could actually lead to gains in coverage – but the US healthcare market would be transformed by a move toward high deductible catastrophic coverage. Read the AHCA bill here. Covered Benefits: The AHCA does not change the essential benefits list, but Secretary Price is interested in reducing essential benefits to lower costs. Tax Credits: Tax credits will be less generous, but will cover more of the population, potentially leading to a shift toward catastrophic plans. Medicaid: The Medicaid expansion ends after 2019, but tax credits will be available to all lower and middle-income Americans. Employer Coverage: AHCA creates a strong incentive for employers to drop coverage, since most American workers will receive tax credits. Universality: AHCA provides tax credits to virtually all Americans without other coverage, cementing the goal of universal health care in the USA. With the exception of abortion coverage, the AHCA does not change the essential benefits under the ACA. HHS Secretary Tom Price has indicated that he will reduce regulations that increase costs – he can do this by limiting the definition of essential benefits. Tom Price has indicated on multiple occasions that HHS will seek to reduce regulations on health insurance markets, and recently both he and President Trump indicated that these changes would be part of “phase 2 & 3” of their healthcare overhaul. In the past Secretary Price has indicated that he will seek to specifically limit the essential benefits requirement while at HHS. The AHCA is particularly punitive towards abortion, barring the use of tax credits for any plan that covers abortion services (page 72 of bill pdf). The AHCA offers up to $14k in tax credits per family, at 2k-4k per person depending on age (pages 90-92 of pdf). It also enables insurance companies to claim tax credits on behalf of enrollees, enabling them to offer cheap or free plans to the public. Consider what this means – insurance companies will be paid between $2000 and $14,000 per year for each enrollment. In a similar situation in the for-profit university industry, tuition essentially matched federal loan programs, creating a no-money-down product for students. With the AHCA, insurers will be strongly incentivized by the market to offer $0 premium plans in order to maximize their signups of younger individuals in particular. With the change of young-old ratio to 5:1 (page 66), and Tom Price’s expected reduction of essential benefits, new catastrophic plans will likely flood the market, providing a no cost option for many. See Appendix I for specific examples using 2017 exchange pricing. The AHCA ends the Medicaid expansion in 2019, but states may have some incentivize to jump in now, because the future funding they receive is based on the number of enrollees at the end of 2019. Beginning in 2020 the Medicaid expansion will be repealed, and only those enrolled under pre-ACA rules (with stricter income and asset tests) can be newly enrolled into Medicaid. The AHCA does close a gap caused in non-Medicaid expansion states, where many workers make too much to qualify for traditional Medicaid, but too little to qualify for ACA subsidies. These individuals will qualify for the new AHCA tax credits. The AHCA removes penalties for not providing insurance (page 84 of bill pdf), and could encourage employers to drop coverage as it provides tax credits to a much larger range of working age Americans. Per the Kaiser Foundation, the average employer contribution to individual employee healthcare is around $4800, with the employee contributing around $1200. At a 25% federal tax rate, this leads to a tax deduction value of $1500, versus a tax credit of $3000 for the median-age American worker. For family coverage, a tax deduction value (25% tax bracket) of roughly $4500 compares to a tax credit of $9000 for a family of four with adults in their 30s. In both cases, both the employer and employee would benefit if the employer dropped coverage, raised wages, and let the employee take advantage of the tax credit. Appendix II presents a fully worked example for a family of four making $100k per year, and shows that the family would likely benefit under AHCA changes. The AHCA offers tax credits to all Americans without employer-based healthcare (except those with higher incomes), and as a result the AHCA accepts the ACA’s premise of universal health insurance. The only Americans excluded from the new AHCA tax credits are those already receiving healthcare from a government program (Medicare, Medicaid, VA, etc) or from employer-based coverage (page 97 of bill pdf). The GOP has produced a plan that implicitly accepts that universal healthcare is here to stay. The end game (relative to the ACA) will look very different, however, with large swaths of the population covered by high-deductible catastrophic plans. Appendix I: Are $0 premiums for catastrophic plans really possible? Is $2000 ($166/month) sufficient to offer a “free” plan to a young adult, or $10,000 ($833/month) sufficient to offer a “free” plan to a family of 4? Using Healthcare.gov, in the Atlanta area the current cheapest plan for age 21 is exactly 1/3 of the $597 charged to a 64 year old, as a result of the ACA 3:1 limit on costs for older Americans. A bronze plan for age 20 is only $126/month in Atlanta, since the 3:1 limit doesn’t apply below age 21 (even in New York City, individual catastrophic plans are available from around $165/month). Since the AHCA raises the ratio limit to 5:1, this shows how $0 plans will fit within the $2000 tax credit. How about for a family of four ages 31, 31, 4, and 2? This priced out at $713/month in Atlanta, below the $10k AHCA annual tax credit. Since the AHCA allows excess tax credits to be placed into an HSA, the family could bank around $1500 per year toward future medical expenses while paying $0 in premiums. In New York City, the family premium would be around $1050/month, leaving the family bearing around $200/month in premiums – but this is before accounting for the impact of the new 5:1 ratio and curtailment of essential benefits, which would likely bring net costs to $0 even in NYC. What about older Americans? A $4000 ($333/month) tax credit will not cover a single 64 year-old’s $600/month premium in Atlanta. If HHS substantially reduces essential benefits, that may close the gap, but with a corresponding loss of benefits. Pre-Medicare age older Americans are clearly the biggest losers under the AHCA reform. But if the AHCA is able to substantially increase enrollment by the young and healthy due to $0 premiums, this may enable more affordable plans further up the age spectrum. Let’s consider again a family of four, ages 31, 31, 4, and 2. Using Kaiser numbers, on average the family and their employer spent a total around $18,000 on health insurance premiums, with the employer contributing roughly $13,000 of that amount. In the 25% tax bracket, the family is receiving $4500 in value from the existing tax deduction. In total, the family is spending about $500 out of pocket on health insurance when employer assistance and tax deductions are considered. What if the employer were to drop coverage, enabling the family to receive a $9k AHCA tax credit, and to raise the employee’s salary by $13,000 instead? The employee would receive $9750 in new after-tax income (considering only a 25% federal rate) plus $9000 in tax credits, or $18,750 total. Assuming similar premiums, the family would then spend $18,000 on health insurance, leaving $750 unspent. In total the family might come out $1250 ahead versus the existing system, and the employer would be able to offload the risk and expense of managing benefits. GOP vote share peaked in 2004 and has been bleeding down steadily, losing about 1.7% in total vote share per election since 2004 . Trump actually under-performed this downtrend, as he dropped 2% (from 28.3 to 26.3) versus the average drop of 1.7% per cycle for Republicans. The GOP seems to turn their base voters out steadily, but this base forms a shrinking percentage of the electorate as the US becomes more diverse. Democratic vote share has been more volatile, reaching a peak in 2008 and bleeding down after. But Clinton didn’t need to match Obama’s 2008 or 2012 performance to win – matching John Kerry or even Al Gore would have been sufficient! John Kerry’s performance, at 30% of eligible voters, would have crushed Trump, while even Al Gore’s 27.4% would have provided the small margin needed in the Midwest to win the election. In a low turnout election, Clinton bled off roughly 4% points of vote share, while Trump bled off only 2% points, leading to his narrow electoral college win. Neither 3rd party votes  nor Trump’s numbers explain Clinton’s collapse – Clinton and the Democratic party have only themselves to blame for frittering away more than 100% of Obama’s net gains! Democrats tend to win when they increase overall turnout, and the data show clearly that turnout collapsed in the 2016 election. Had Hillary Clinton managed to turn out any of the urban vote in the Midwest, or gotten millennials excited, she’d have been fine. She did neither, and in absolute terms had the worst performance for a Democrat since her husband, ironically (who won handily in 1996 in a low turnout election). In short, I blame Democrats and the Clinton team in particular for this loss far more than I credit Donald Trump. According to the data, he likely performed just below a more typical GOP candidate, while Clinton greatly under-performed the last four Democratic campaigns. Arizona is rapidly trending blue – more rapidly than expected. Obama lost Arizona by around 213,000 votes in 2012, while Clinton lost by only 85,000 votes in 2016. This aligns with a 2014 study on demographic change, putting it right on track to lean blue in 2020. Winning just Arizona’s and Florida’s (whose demographics are also shifting) 40 electoral votes replaces all the rust-belt states Clinton lost, creating a 272 electoral vote win. Who voted in 2008 that didn’t turn out in 2016? Young people and minorities. 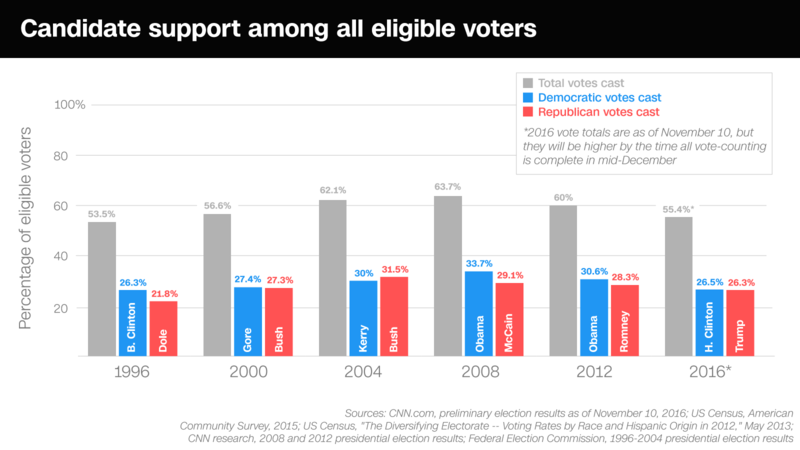 Democrats win when turnout is high. Turnout is high when the most progressive parts of the Democratic base are excited. Therefore, Democrats’ direction should be clear – there is no one left in the center, and it’s time to move forward with the progessive wing of the party. Had Democrats won in 2016, winning again (four in a row) would have proven even more impossible given the tick-tock nature of the Presidency in the US. Since FDR, one party has won three straight presidential contests only once, in 1988 – and none have won four straight. Votes are still being counted, and the final tally will likely show Clinton’s vote share edge close to 27%, still below Al Gore’s 2000 performance. Per the chart above, McCain lost 2.4% points from Bush 2004, and Romney lost another 0.8% points from McCain. Trump lost roughly 2% points from Romney – leading to an average decline rate of just over 1.7% per election cycle. Mr. Trump lost more than this amount, leading to the conclusion that he might have under-performed relative to an “average” GOP candidate. Above, we see that in 2016 voter turnout was around 55.4%, with 52.8% captured by the two mainstream parties. If all 2.6% lost to third parties came from Clinton voters (and it almost certainly dd not), that still implies that she under-performed Obama 2012 and Kerry 2004 by around a percentage point – and this assumption is far too generous to Clinton. In the article, a type I diabetic incurs over $26,000 for her routine diabetes care annually. She uses much of the latest technology, and it costs a fortune. I desired the simplest and least intrusive treatment that would work. No machines strapped to me 24/7, no intrusive wires. New treatments are not time-tested, and are later found to have serious flaws. Note Avandia, a popular diabetes drug until it was pulled from the market for elevating heart risks. Why not try a simple solution, and only escalate to a complex (and expensive) solution if it fails? My treatment plan is working, as my A1C is low (generally under 6). While my approach wouldn’t work for every patient, shouldn’t doctors start simple and work up from there? Of course not – there’s no financial incentive to do so. But converting, say, 1 million diabetics (there are tens of millions in the US) from 25k/year to 1k/year treatment would save $24 Billion per year. At some point insurance companies, payors, and the government are going to have to wake up, and make cost-effectiveness a metric in health care decision-making. Since I use mostly generics, all of my expenses are out of pocket save my annual doctor’s appointment. Including the doctor’s appointment, associated tests, and both out-of-pockent and insurance reimbursements, the total cost of care is still less than $1000/year. I virtually never link to commercial interests in my posts, and I have never received compensation for doing so. I linked to Relion and American Wholesale Diabetes in this post simply to inform those who might benefit from the information. Gun Control And Mass Shootings: Would Lives Be Saved? An analysis of every US mass shooting over the past 30 years shows that two small policy changes, restricting high-capacity magazines and introducing stringent background checks, might have saved over 500 injuries and deaths, reducing total casualties in mass shootings by 50%. Various proposals have been set forth since 2012’s numerous mass shootings, ranging from much stricter gun regulations to arming more individuals in public spaces. Starting from Mother Jones’ list of US mass shootings over the past 30 years, I analyzed the potential impact of two proposals in particular: would a ban on high-capacity gun magazines have reduced casualties, and would stringent background checks of gun purchasers have reduced the number of shootings? I researched the incidents surrounding each shooting to determine whether each proposal would have had any impact. The data are summarized in the table below, with the full research spreadsheet available here. Totals: 459 481 250 324 Legal in 58 of 63 cases 54% of deaths and 67% of injuries might have been prevented with the policies analyzed. Newtown, CT Sandy Hook Elementary 27 2 17 0 Yes – legal weapons in same household The shooter’s rampage was stopped by a quick police response. If the shooter had to reload 3 times as often, he would hit many less victims, as he fired on each victim multiple times. Minneapolis, MN Sign Company 6 2 1 0 Yes The shooter reloaded at least once during the shooting, and initially struggled with victims. Oak Creek, WI Sikh Temple 6 4 3 2 Yes In a public setting with many adults, it’s possible shooter would have been stopped while attempting to reload, or would have retreated outside more quickly if he had less capacity. Aurora, CO Theater 12 59 12 59 Yes A lucky form of weapon capacity control prevented a larger disaster, as the shooter’s weapon jammed and he was only able to fire roughly 1/3 of the 100 round magazine. A properly integrated background check system might have stopped the incident entirely. Seattle, WA Cafe 5 1 0 0 Yes It’s not clear that the gunman ever needed to reload, and though he had a history of mental health problems, he was never treated and never convicted of a felony. Oakland, CA – Oikos University 7 3 7 3 Yes HCM limit would have no impact here, but the shooter was expelled from school for behavioral issues, which might have been caught if this data were submitted to a comprehensive background check system. Seal Beach, CA – Salon 8 1 3 0 Yes The shooter reloaded during the shooting per police reports, so lowering weapon capacity would likely have lowered casualties. Carson City, NV – IHOP 4 7 2 3 Yes The shooter fired over 30 rounds per eyewitness accounts – lower capacity would have constrained him. Tucson, AZ – Giffords shooting 6 13 4 9 Yes Shooter was tackled and stopped while he tried to reload – direct evidence that lower capacity would have decreased the toll. Lakewood, WA – police officer shooting 4 0 0 0 No Capacity limits might not have helped, as the shooter fired on four victims seated at one table, and hit all of them with his initial salvo. Ford Hood, TX – army base 13 29 9 19 Yes Shooter reloaded many times, and 30 round magazines enabled him to fire roughly 170 rounds before being shot himself by military police. Multiple soldiers attempted to charge the shooter – if he had only a 10 round magazine, it’s entirely possible that he would have been tackled and stopped upon initial reload. Carthage, NC – nursing home 8 3 0 0 Yes Since shooter used multiple weapons and never reloaded, it’s unlikely capacity limits would have mattered. Dekalb, IL – Northern Illinois University 5 17 5 17 Yes This incident’s casualty count is quite low because the shooter first fired with a very low capacity weapon, his 6-round shotgun – enabling many students to escape the classroom. Shooter also had a long, documented mental health history. Kirkwood, MO – City Council 6 1 0 0 Yes Shooter used low-capacity revolver initially, and took a higher capacity weapon from a victim (police officer). Omaha, NE – Westroads Mall 8 4 5 3 No Shooter appears to have emptied one magazine and then taken his own life. Crandon, WI – sheriff’s rampage 6 1 0 0 Yes Shooter used a service weapon, so proposed rules/limitations would have had no effect. Blacksburg, VA – Va. Tech 32 23 32 23 Yes Shooter reloaded many times, and used multiple weapons. Mental health check would have prevented weapons acquisition. Nickel Mines, PA – Amish School 5 5 2 2 Yes Once shooter started firing, sheriffs approached – he killed himself as they arrived, and likely would not have had a chance to reload. Seattle, WA – Capitol Hill 6 2 6 2 Yes Shooter had a weapons-related felony charge, which was reduced to a misdemeanor. Red Lake, MN – high school 9 5 3 2 Yes Shooter possessed a gun in his bedroom despite being treated with Prozac. Since he was an adolescent, and his parents/guardians chose to give him a gun, background checks would be ineffective. Shooter shot his grandfather who was a police officer, and took his weapons. Brookfield, WI – Church group 7 4 2 1 Yes Shooter suffered depression, but had no mental health or criminal records. Wakefield, MA 7 0 5 0 Yes Shooter used high-capacity weapon and also had a history of mental illness, but with the mental illness far in his past and no criminal record, even stringent checks might not have denied him weapons. Shooter stopped firing at an arbitrary point and sat calmly til arrested. If he had lower capacity weapons, stopping to reload multiple times might have caused him to sit and wait for arrest earlier. Honululu, HI – Xerox 7 0 3 0 Yes Shooter acquired a large number of weapons long before mental issues began. Fort Worth, TX – Wedgwood Baptist Church 7 7 2 2 Yes Shooter committed suicide after emptying three magazines – but he had six more loaded. Has the magazines been 1/3 smaller, that would have lowered the toll proportionally. Atlanta, GA – Day trading 9 13 0 0 Yes The shootings happened in multiple separate incidents, making it less likely that HCM limits would have had an impact. Barton was suspected but never charged in earlier murders, so background checks would have had no impact. Littleton, CO – Columbine High 13 21 6 10 No Shooters used a high capacity Tec-9 and standard capacity 9mm, so avg capacity is used here. Details of the shooting indicate that in many cases shooters fired at the same victim multiple times – if limited in capacity, this would have reduced their ability to fire on additional victims. Springfield, OR – Thurston High 2 24 1 19 Yes Shooter was tackled and stopped when he first tried to reload – a clear indication that lower capacity would have further limited casualties. Jonesboro, AR – Westside Middle School 5 10 2 3 Yes Shooters ran away after firing 30 rounds – lower capacity might have reduced total rounds fired. Newington, CT – Lottery worker 4 0 0 0 Yes Shooter chose specific victims and fired relatively few rounds, so capacity limits make no difference here. Fairchild AFB, WA – hospital 5 22 5 22 Yes Shooter possessed only one 75 round drum magazine – so he would never have to reload. Military police arrived quickly and killed perpetrator. Garden City, NY – LIRR 6 19 2 6 Yes Shooter emptied two 15 round magazines and was tackled while reloading with a third magazine. Total rounds fired would have been decreased by 1/3 were magazine capacity limits in place. Watkins Glen, NY – office 4 0 0 0 Yes Shooter killed four intentional targets with relatively few shots, and then waited for police to arrive – perhaps less than 10 shots total fired. Olivehurst, CA – Lindhurst High School 4 10 0 0 Yes Shooter used two weapons and fired relatively few shots, so high capacity weapon limits would have no effect here. Shooter also had no prior criminal or mental history. Royal Oak, MI – postal 4 6 4 6 Yes Shooter had his concealed weapons permit revoked on concern of mental illness. Shooter also used high-capacity magazines with his rifle and fired scores of rounds according to police. Killeen, TX – Luby’s Cafeteria 20 24 8 10 Yes Used high capacity pistols and reloaded multiple times – capacity limits would have enabled more victims to escape, as many escaped by exiting the restaurant. Stockton, CA – schoolyard 5 29 5 29 Yes Shooter had a lengthy arrest history and had served time in jail as an accomplice to armed robbery, and yet was allowed to buy weapons. Palm Bay, FL – shopping center 6 14 6 14 Yes Shooter used a high capacity .223 caliber rifle, and killed two police officers during the shooting – one of them as the officer was trying to reload. Perhaps if the shooter’s capacity were lower, the officer might have himself fared better. Gunman also had prior assault conviction. Dallas, TX – nightclub 6 1 0 0 Yes Shooter used an unknown handgun, emptying it into crowd and then rushing out – unclear that capacity limit would have any impact here. The analysis above attempts to answer the question – what would have happened in these incidents had the proposed laws been in place? Of 459 deaths and 481 injuries in 63 shootings, I estimate that 250 deaths and 324 injuries (54% of deaths and 67% of injuries) might have been prevented with the analyzed proposals. Each proposal, its method of action, and the analysis approach is described further below. Definition: Sales of high-capacity magazines to and between private citizens would be completely banned, and imports of high-capacity magazines for private use would be banned as well. While many magazines would exist in private hands, a magazine buyback could then be used effectively, as magazines are relatively inexpensive. In some instances, the shooter was disarmed by potential victims while trying to reload – smaller magazine size clearly would have limited total impact in these shootings. In some instances, potential victims fled during breaks in the shooting enabled by reloading – if a shooter has to reload 2 or 3 times as often, this effect is multiplied. In some instances, law enforcement arrived relatively quickly, and most damage in the shooting was done via the initial magazine – a smaller magazine would have limited impact in the shooting in these instances. In a few instances, victims attempted to rush the shooter immediately. If a shooter could only fire 10 shots instead of 20-50, it’s possible that he might be tackled quickly rather than be able to continue shooting. In most instances, the shooter committed suicide after doing a certain amount of shooting, but always before exhausting ammunition. Since each reloading represents a break in the act, some shooters would commit suicide after having fired fewer total rounds if they were capacity constrained. In a few instances, the shooter appeared to choose a specific weapon because of its high capacity. If high capacity magazines were not available, would the shooter still go forward with the attack? In 18 of 63 shootings, shooters fired relatively few rounds, chose a small number of specific victims, or used standard capacity weapons. In these instances the high-capacity magazine ban has no impact. 29% of actual mass shootings fell into this category. Analysis Method: If the shooting fell into the last category above, then zero impact is noted in the analysis. Otherwise, the casualty count is reduced by the ratio of the shooter’s magazine size to standard magazine size – if the shooter used a 30 round magazine, then the casualty count is estimated at 2/3ds lower (rounded up) with a standard capacity magazine. This approach will tend to underestimate the effect of a ban in instances like 1,4, and 6 above, while providing an accurate estimate or an overestimate in instances like 2, 3, and 5 above. In aggregate, I think this approach is unbiased. Definition: Create a mandatory national database of all felons, mentally ill, and others posing threats (anti-terror lists, those who have made threats against schools or other institutions). Mandate that all firearms transactions for new and used weapons, in public and private transactions, be checked against this database, with instant results. This stands in contrast to the current background check system, which is done on paper and via telephone call, not electronically. Out of 63 mass shootings over the past 30 years, only 5 have involved illegally purchased weapons. Some of the shooters had a history of mental illness or a criminal record – preventing a sale of firearms to these individuals would reduce the frequency of shootings. Many of the shooters with a history of mental illness had no criminal record – it’s unlikely that they would know how to obtain an illegal firearm. Some of the shooters purchased weapons in the days after making threats against a school or other institution – in these cases, a properly implemented stringent background check system would have prevented the weapon sales. Analysis Method: Shootings were identified in which a shooter had a documented history of mental illness, a criminal record, or had made threats against an institution prior to buying a weapon. In these cases (17 instances total) it’s assumed that the casualty count is reduced to 0, as the shooter would have been unable to obtain a weapon. In reality a certain number of shooters would then try to acquire weapons illegally, and some might succeed. But a certain number of mentally-ill or former felons might never try to obtain a weapon if they knew they had no easy or legal means to do so, providing an offset. Two other proposals have been mentioned in the last several months – a ban on assault weapons and the placement of more armed guards or civilians in public places. On the question of assault weapons, the data from mass shootings shows that shooters preferred a range of semi-automatic weapons with high-capacity magazines. Weapon capacity makes a difference, but the type of weapon (handgun vs rifle) does not. With regard to armed bystanders, in 9 of 63 shootings armed individuals (often police officers) were present. In several cases armed individuals became victims in the shooting, and the presence of armed individuals did not prevent the shooting from taking place. However, this analysis is by definition incomplete – this is an analysis of shootings that actually did take place, and doesn’t include data on shootings that were stopped by armed individuals. The evidence here suggests that the element of surprise may render concealed weapons somewhat ineffective, but this is not a conclusive finding.